This species is accepted, and its native range is S. Ethiopia to Central Tanzania. Glabrous shrub with spreading or tangled branches to 1 m. or so, with tufts of leaves and flowers pointing upwards. Leaves subopposite to alternate on long shoots, mostly in tufts on very short shoots, shortly petiolate, linear to oblanceolate, 5–30 mm. long, 0.7–4 mm. wide, pointed to rounded at the apex, attenuate at the base, obscurely nerved. Umbels terminal from leaf-clusters, 2–4-flowered; peduncle 0–7 mm. long; pedicels 3–10 mm. long; bract with a small lanceolate-triangular limb 1–3 mm. long. Corolla 4–5 cm. long; tube grey to slightly purplish grey, dull purplish or brownish inside, lobes marked yellow or yellow and red on claws; apical swelling of buds narrowly elliptic, pointed to slightly apiculate, 4–5 mm. long, 1.5–2 mm. in diameter; base of tube not swollen; lobes erect, 9–10 mm. long, expanded around filament-attachment below the narrow claw, upper half to two-thirds narrowly spathulate to linear-oblanceolate, attenuate to tip. Stamens yellow, inflexed, tapered, narrowed near tip, without a tooth; anthers 1.8–2.5 mm. long. Style mostly green, yellow near the apex, slender, flattened above, slightly narrowed to 4 mm. long neck below small green stigma. Berry obovoid, 10 mm. long, 5–6 mm. in diameter. Deciduous bushland, on Acacia; 30–1500 m.
Hedberg, I., Friis, I. & Persson, E. (2009). 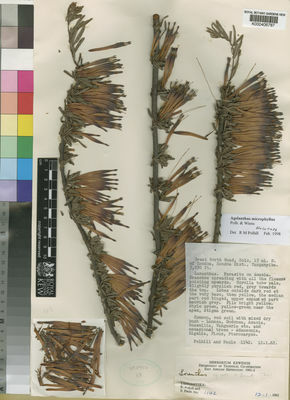 Flora of Ethiopia and Eritrea 1: 1-305. The National Herbarium, Addis Ababa University, Ethiopia & The Department of Systematic Botany, Upps. Polh. & Wiens, Mistletoes Afr. : 150 (1998).